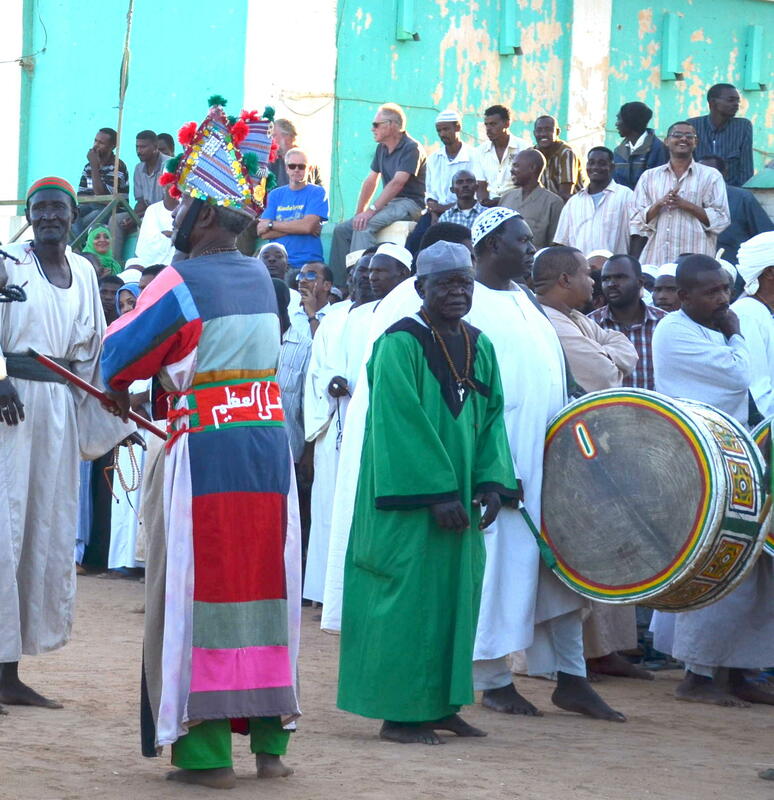 Circling around and around the center pole, they dance into a trance in the shadow of the Sheikh Hamad-el-Nil Tomb in the Omdurman section of Khartoum, Sudan. While circling, these Sufis chant gratitude to the Prophet Mohammed and repeat “there is no God but Allah” many times. It is the first line of the Muslim profession of faith. 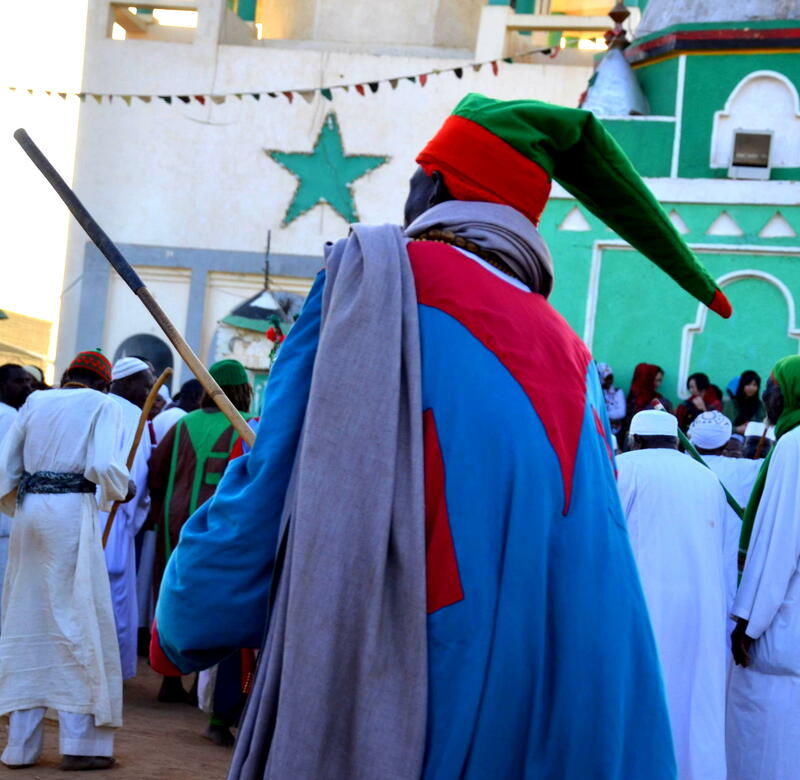 To start the ritual ceremonies every Friday except during Ramadan one hour before sunset, the dervish march across the cemetery to the Sheikh’s Tomb carrying their green madrassa banner, which is placed on the pole in the center of the ceremony yard. The purpose of this dance ritual called ‘dhikr’ relies on the recitation of God’s name to help create a state of ecstatic abandon so the follower’s heart can communicate directly with God. 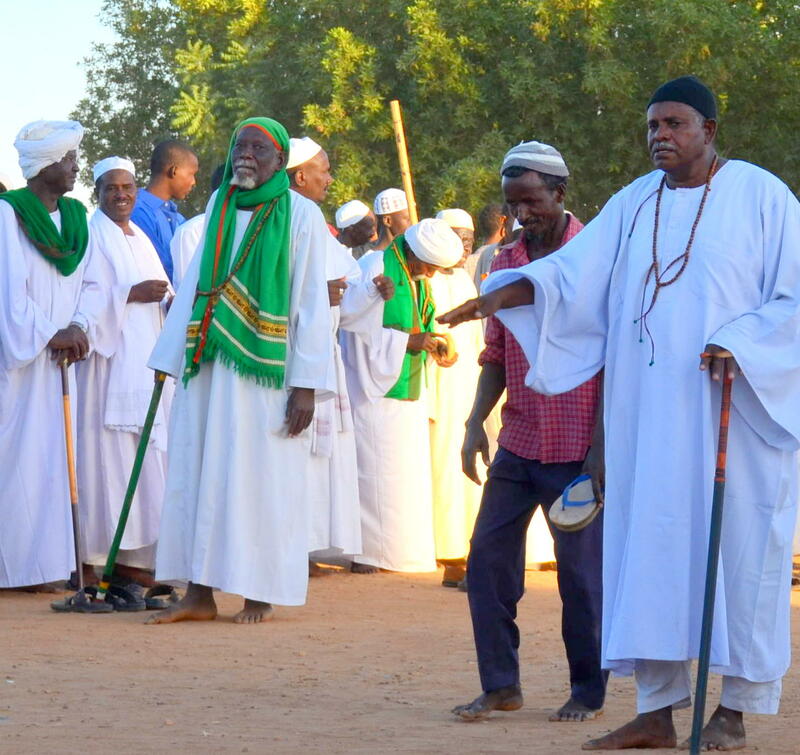 Also called Dervishes, the ritual is put on by the masters of the madrassa, an Islam religious school, in Khartoum, who are dressed in red and green gallabiya robes while the rest of the believers wear the white gallabiya robe. 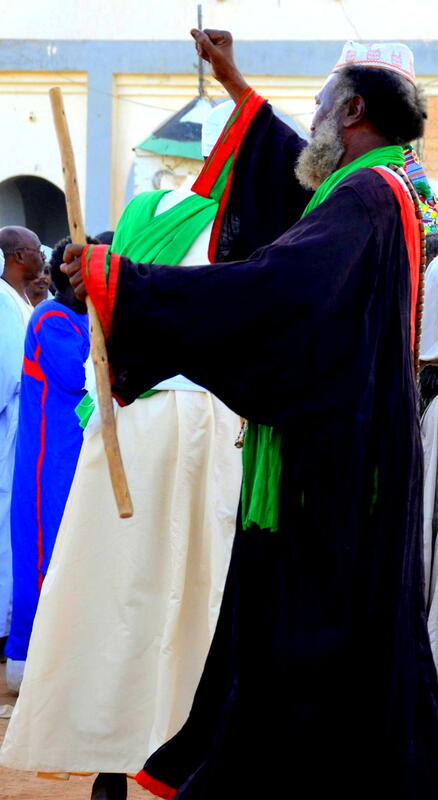 The Sudanese red and green robes have patches like those put on the robes in ancient times to cover a hole. Now it is done for decoration to keep the tradition. Keeping the beat provided by drums and cymbals, the dervishes start whirling with the music, the fragrance of frankincense, and the endless repetition of religious chants, then dizziness happens, ending in a state of trance. Over 500 people watched this ritual the day we visited. 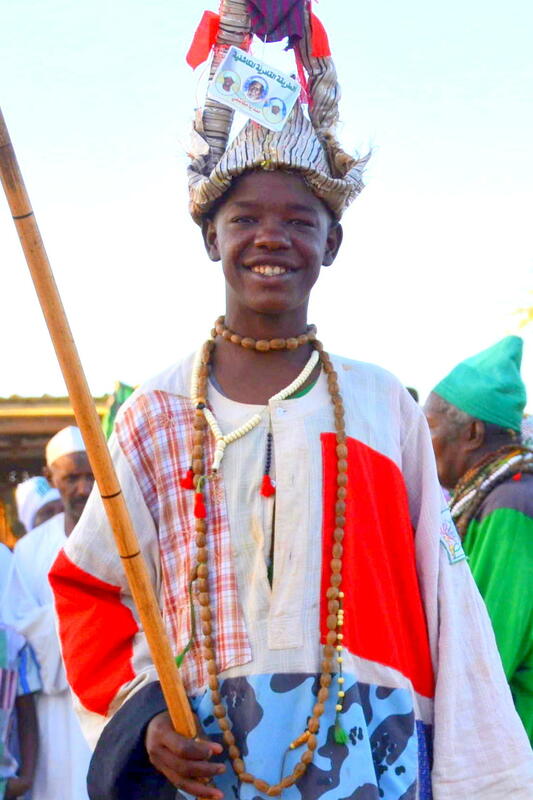 The Sudanese dervishes wear beads and the elder ones can have scores of beads wrapped around the neck showing their status as master in the madrassa. Some carry a stick symbolizing power or a scepter-like instrument. 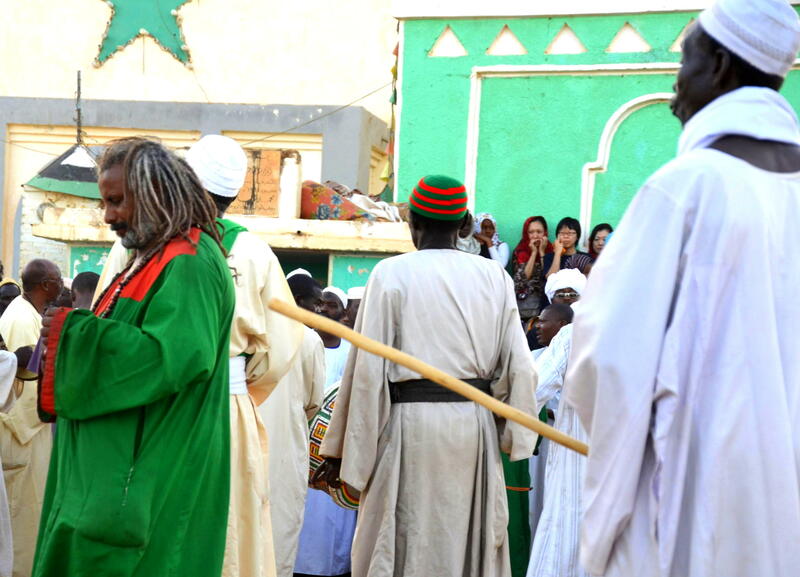 Long hair and dreadlocks are also part of the Sudanese dervish look. The ceremony lasts for at least 45 minutes and the singing and chanting slows down before the sun sets below the horizon. 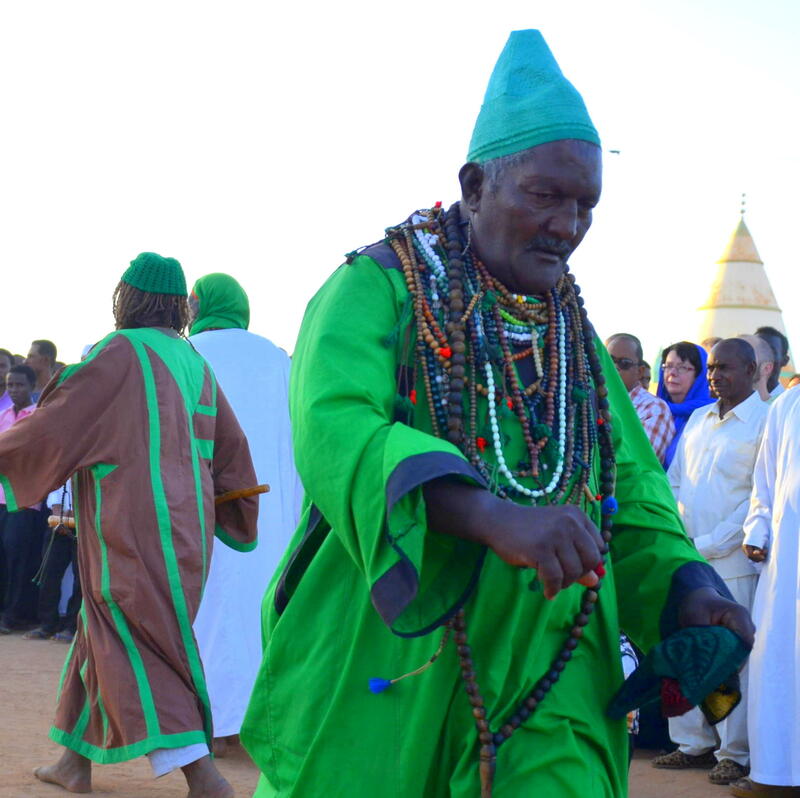 Right before the sunset, a dervish walks around the crowd carrying smoking frankincense which is considered to be a blessing to the faithful. Sufism is the ancient belief about purification of the soul in the pursuit of inner peace. It is associated with Sunni and Shia Islam. It began in Baghdad and spread to Iran, India, North Africa and Spain. 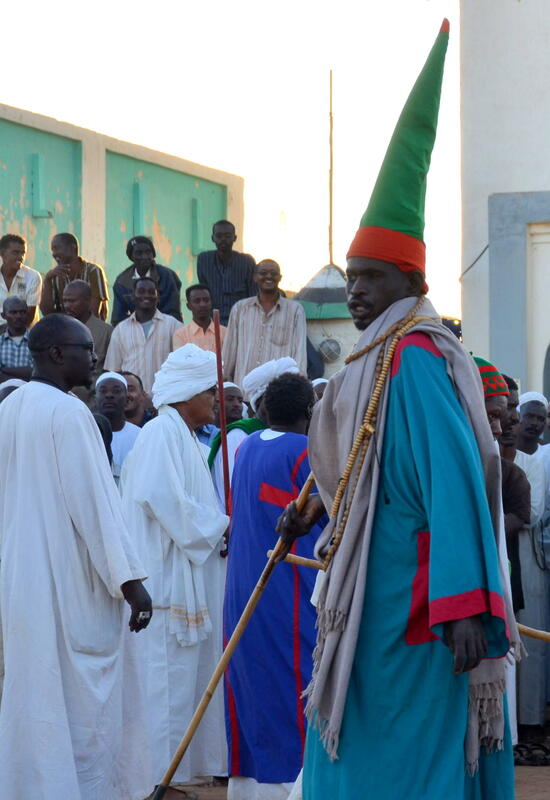 The Sufi order, Tariqa Qadiriyyah is the order in Sudan. 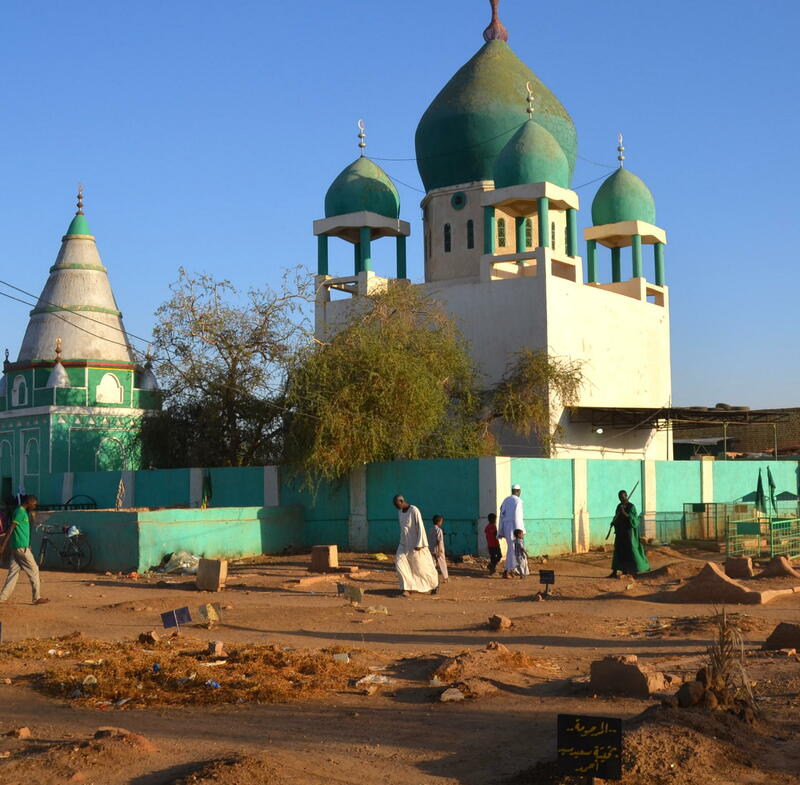 The mausoleum tomb in Omdurman belongs to one of the 19th century Qadiriyyah leaders, Hamad al Nil. 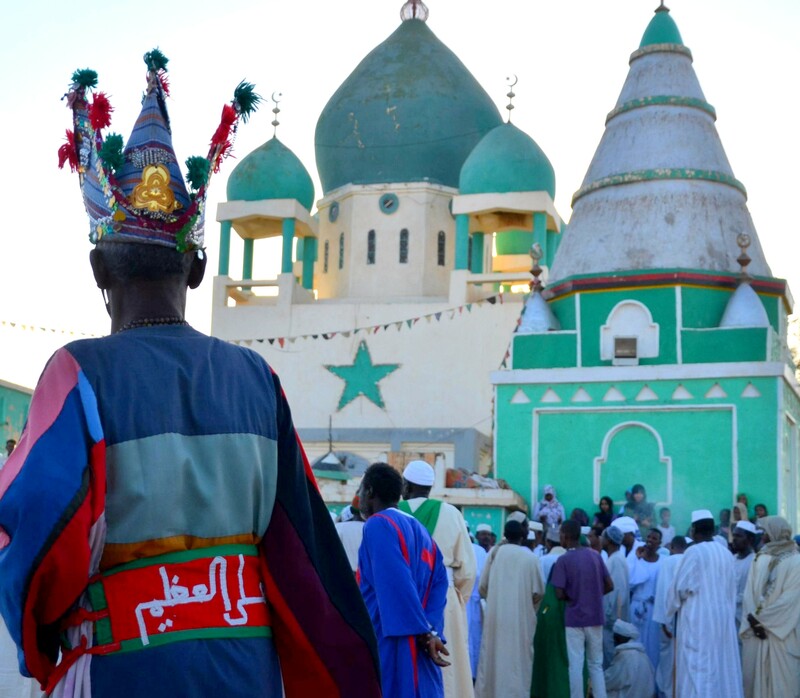 And Khartoum is divided into 3 parts by the Blue and White Nile River and Omdurman is 1 of the parts of the city. The dervishes are not whirling dervishes. But the whirling dance did come from the Mevlevi order in Turkey and is one of the physical methods used to reach religious ecstasy. 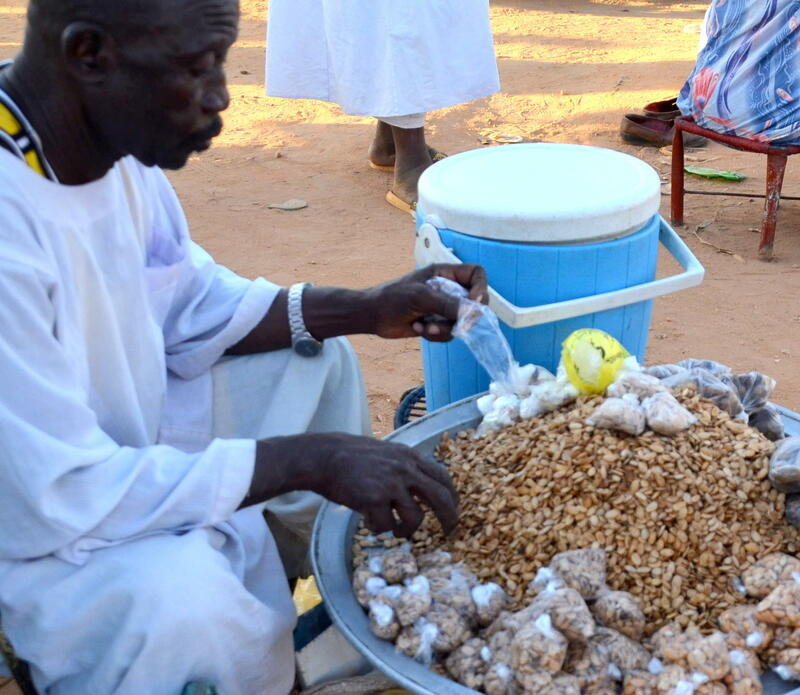 Family, friends and vendors bring food for the ceremonies to give to the poor and to sell. There was tea, cooked beans, beads, frankincense and other foods and items available. 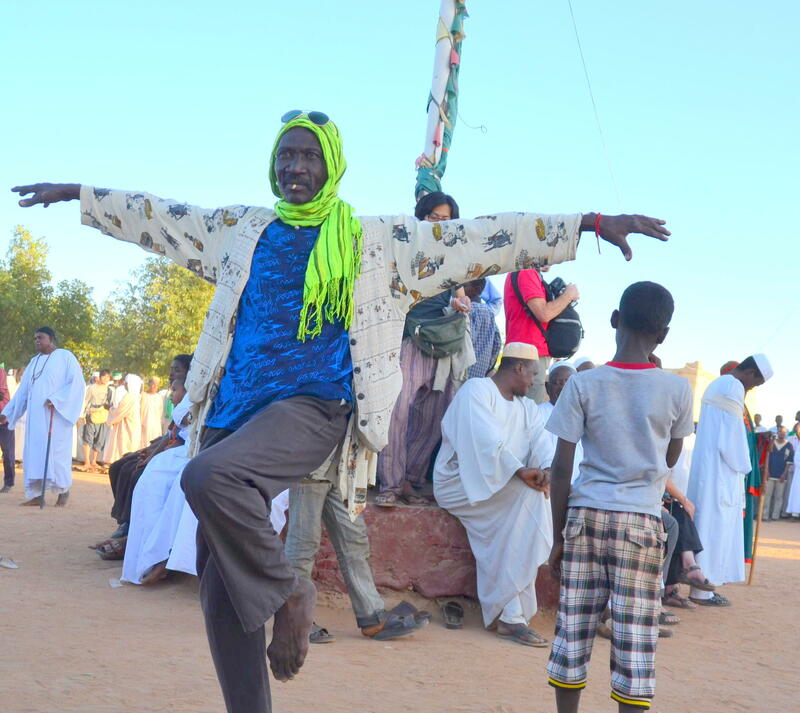 And almost every Friday, the dervishes continue to whirl dance around the center pole reciting “there is no God but Allah” to help create a state of nirvana so the follower’s heart can communicate directly with their God. 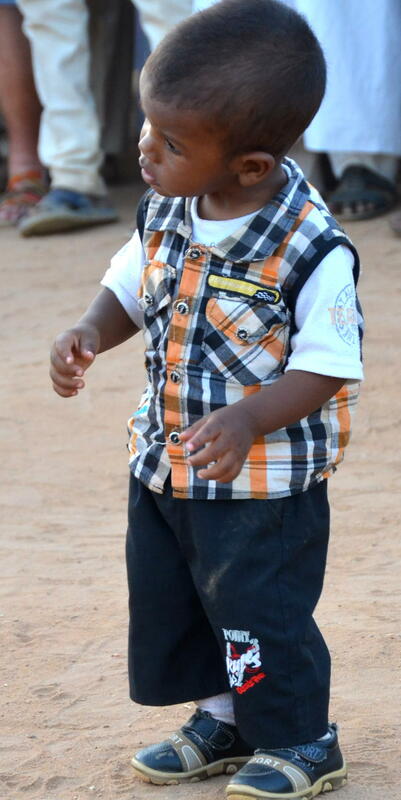 During the ritual whirling dance, this little boy went into their circle and copied their dance. 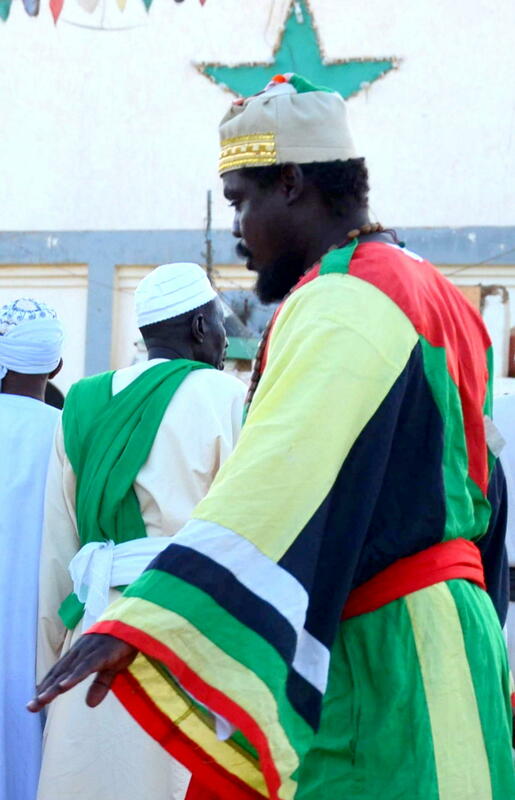 Hi, I really want to see this when I;m in Khartoum next month, but I’ve read that women are not allowed to stand in the front row while watching the ceremony, so I’m worried about being unable to get any decent photos as I’m quite short; you seem to have got quite a few good photos – did you have any trouble? Did they make you stand further back? I was in the center and therefore able to take photos 360 degrees of all.